Many Google Chrome features aren't enabled by default because they're not ready for primetime or they're too advanced. Unfortunately, you can't enable them from the interface and you have use command-line flags. 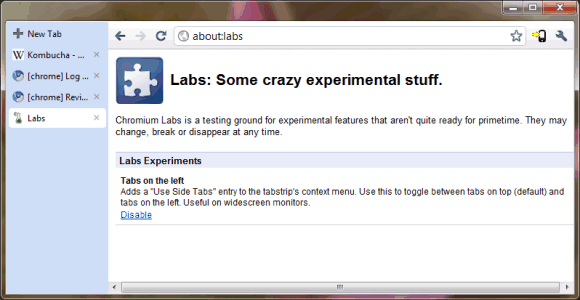 A recent Chromium build added a new internal page that lets you enable some advanced features: about:labs about:flags. "Tabpose is currently the only lab on Mac, tabs-on-left the only lab on Windows. about:labs should not be visible on the stable channel. Labs that were enabled on the dev channel should not be enabled on the stable channel." Tabs-on-the-left is especially useful on widescreen monitors, while tabposé is a Mac-only feature that adds Exposé for tabs. Both features can also be enabled by adding command-line flags to a Chrome shortcut: --enable-vertical-tabs for side tabs and --enable-expose-for-tabs for tabposé. After enabling vertical tabs using the command-line flag, right-click on a tab and select "use side tabs". killer! was fed up with using command line on windows and they should definitely add more feature hidden behind command line switches. it adds an option to tab context menu "Use sidetabs"
It would be better not just tabs aside, but tabs tree, middle click open new child tab in tab tree. I can't get the vertical tabs nor the about:labs and I am using the latest dev 7.0.503.0.
i want vertical tabs, will be so cool on my wide screen. A.W.E.S.O.M.E! Just like extension, but improved even further than Firefox had. It's not yet available in Chrome Dev Channel and not even in the latest Canary build. You can try it by installing the latest Chromium build. For some reason the about:labs page simply will not load for me. Any thoughts on why this might be? I've updated to the latest. You need Chromium 7.0.508.0 (build 57635). For anyone, please use the latest Chromium Build: 7.0.508.0 build 57672 - NOT the latest Dev channel of Google Chrome (7.0.503.1 dev). Then, don't forget to add the command-line flag/parameter. It works great, not even a glitch for me. But notice the experiment may change, break or disappear at any time. @Anonymous: Firefox has been around for years too. Opera has this to, but you are missing a important feature. Look at Tree Style Tab extension for Firefox, this is the ultimate vertical tab mechanism IMHO, do it and I'm think in changing to Chrome. Cool, now it would be nice if they add some decent cache control options in the default UI (not hidden or anything) of Chromium and Chrome. Without cache control, Chrome is useless for me as it eats my HD space like warm bread.. It's about freaking time, but what would really be nice is for Chrome to let extensions do stuff like this - it would have happened a long time ago. For those of you like me whose Macbook Pro does not support 3 finger multitouch swipe, the keyboard shortcut is cmd-ctrl-t (matches camino). I don't know of any other documentation on the 'TabPose' or 'Tab Overview' feature. Does anyone know how to get to this feature now? I have settings stuck in experimental mode and they won't change now. (either chrome 8 dev, or chrome 9 canary) used to work with chrome://labs, no longer. This doesn't make any sense without the ability to widen the tab sidebar. The whole reason I use it in firefox is to see MORE of the tab name. chrome://flags do work too ! for the vertical-tabs for side tabs which I like a lot, anyway to reduce the width? I like for it to show only the icon/favoicon and tooltip of the url. possible to massage to manually change width? Hmm. That's true; guess it's less about vertical real estate than being able to see a list of your tabs more easily than the horizontal tab layout (if you have a whole lot of tabs open). Thanks for pointing this out. BUG: when opening saved bookmarks with vertical tabs. The order of tabs are reversed. I am also using 16.0.912.21 beta-m and --enable-vertical-tabs no longer works as of today. I also don't see vertical tabs on the feature list that is displayed using about:flags (but I don't know if vertical tabs was ever on that list for me).